Enjoy BOGO Sale offer at Canadian American Eagle Outfitters stores. Buy one, get one 50% off. 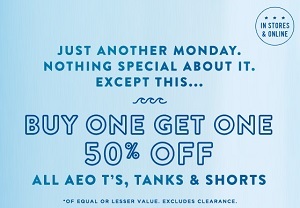 Offer is valid on AEO T'S, Tanks & Shorts. Second item must be of equal or lesser value. Excludes clearance merchandise. Source of the information is American Eagle Outfitters. More details about the offer at Canadian stores.